Freedom From Fear met the leader of Solidarnosc, a few days from the 20th anniversary of the fall of the Iron Curtain, marking the end of the Cold War, during his visit in Italy to Torino Spiritualità to talk about 1989: the year that changed the world. 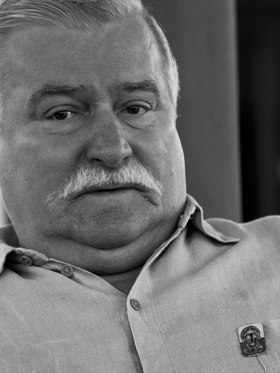 Today, Lech Walesa is 65. From his onerous past he still drags behind him an entourage of assistants and press officers. He is very punctual to our meeting in the hall of his hotel; he wears a shirtsleeve with his Solidarnosc badge pinned to his lapel, as to emphasize his proud belongings. He is very straightforward. His manners are not pretentious and yet this white-moustached electrician from Gdansk, has irremediably shaped the 20th Century as the leader of the movement that led Poland out of the Communism, turning his country into the icebreaker that would bring the rest of Eastern Europe into the “Velvet Revolution” of 1989. His prominent figure, along with those of Pope John Paul II and Mikhail Gorbachev, deserve to stand among those who ended the Cold War changing the course of history. Mr. Walesa, what’s your job today? My job? am a professional “ex”. I am an ex-shipyard worker, I am an ex-trade unionist, I am an ex-Head of State. I am an “ex” in everything. Poland was the first country to breach the wall of fear towards Moscow, giving way to the collapse of the Soviet system. Why do you thing all of this started here rather than in other countries of the Warsaw Pact? How was Poland different from the rest of the Eastern bloc?To tell the truth, our struggle to free ourselves from the Soviet yoke had never stopped. Certainly, all the propaganda demonstrations organized by the communist government were undoubtedly stronger than ours, and we were not even able to equate their ability to aggregate organised masses: we were well aware of our weaknesses. In 1980, we eventually understood how this battle had to be fought, but we were not ready to do this yet. The Holy Father [John Paul II N.o.E.] helped us a lot in this. He had awakened our consciences and those of other nations, we found asylum in churches, where we could finally organize ourselves through Masses and prayer. In this renewed national unity, clandestine organizations were able to take the “patrimony” left by the Holy Father and to carry it out on the streets through strikes for the new battle and the new movement. For the first time, the Polish realized that the communists were not so numerous after all. There were as many of us as there were of them. So you attempted to organise your activities in the same way your government did? The same methods adopted by the oppressor, but used for counter-propaganda? I organized the shipyards’ workers and then we proclaimed a massive strike in August 1980, which gave rise to a wave of strikes over much of the country. Other professions immediately joined us in this effort: physicians, intellectuals, writers, artists, etc. The next step was to invite the media to the yards of Gdansk (formerly Danzig) to tell the communists: “we have never wanted you, never. You have always lied to us. You do not represent us and even if you try to make greater demonstrations you will not succeed.” There was no answer to our yelled statements, but this represented our first gain. Using the same tested methods of the communists we reached our victory over them. Can the slow agony of communism in Poland and the victory of Solidarnosc be correlated to the big strike of August 1980? Yes, it is in this moment, with the beginning of the strikes, that communism started to crumble. By protesting so forcefully, we had won 1 to 0 and, strong of this first conquest, we exacted the legalization of an independent labour union. That was the dawn of the slow agony of the system we were opposing. And even if they had been killed all of us in that shipyard, the whole world would have stood on our side. The government tried to save itself: General Jaruzelski proclaimed martial law in an attempt to delegitimize Solidarnosc. Nevertheless, we were aware of what we wanted to ultimately achieve and we also enjoyed the support of the whole world community. Thanks to this support we attempted again the same step a few years later. The true victory can, thus, be identified during the first years of the ‘80s in the shipyards. Then other countries joined our effort, but at that time communism didn’t have any longer the same power it had before the strikes in Gdansk. Although for a certain time Solidarnosc was a clandestine organization, is it reasonable to think that you had institutional relationships with the politicians and the governments of some countries? Which political figures, more than others, helped Solidarnosc in regaining freedom? Several protagonists of the political scene had similar views on the situation in East Europe. Mitterrand, Kohl, Thatcher, Gorbachev and Reagan were all supporting us in one way or another. They were aware that communism was ineffective, with no freedom and, therefore, adverse to their systems of values. For instance, the then U.S. President, Ronald Reagan deployed an arms race, which eventually weakened Moscow from the economic point of view; the French President, François Mitterrand, supported the struggle of the Polish workers; the German Chancellor, Helmut Kohl, was interested in the reunification of the two Germanies, while the Holy Father, John Paul II, just wanted to free the souls and the people of Poland. As for Lech Walesa, he was thinking of how to dismantle communism. What happened to Solidarnosc immediately after the big strikes? When communism was strong and apparently unbeatable, it somehow constituted a monopoly. We consequently shaped Solidarnosc along the same pattern giving our activities and politics the form of a monopoly. The reason for this is that a monopoly can be only fought and beaten by another monopoly; but, when one falls, the other must change as well. Then we broke the old structure of Solidarnosc, building democracy, pluralism and a new economic system; therefore from an organizational point of view the movement ceased to exist. Gorbachev believed in the possibility of reforming communism, while we were convinced that the first reform would have led to the fall of communism altogether. I hoped in this reform, aware that, with the removal of the first brick, the whole structure would have crumbled and the whole system would collapse at once. I would reckon that what could have appeared to some as [Gorbachev’s] defeat [being unable to successfully reform the communist system N.o.E] was at the same time his greatest success. What do you see today in the political landscape of Eastern Europe? I believe that President Obama, for instance, is doing a good job. He is taking into account the need to approach Moscow differently in order to build wider alliances, he is gaining the trust of those governments that believe in dialogue and, in addition, he is making an effort to understand the particularities of politics in Eastern European countries. From our side, in Poland, we keep our freedom and democracy at heart. If you had to judge yourself in front of history, where do you think you have made mistakes? If I have made mistakes in my political life? No, I don’t believe so, at least as far as little things are concerned. But I don’t have any regrets. If then the jury of history will blame me for something, I cannot know that, but I would do it again. * Nicola Filizola is Media Consultant at UNICRI.